The generally accepted standards for the design and manufacture of “Below the Hook Lifting Devices” do not require mandatory load testing by the manufacturer. OSHA on the other hand, demands it - and the burden falls on the user to provide certification that his lifter has been load tested prior to his use. Hefty fines can follow for failing to have tested lifters. Can you say, “Buyer Beware”? Tandemloc, counter to this standard and many of its competitors who offer testing by request as an option, has a long standing policy to load test every lifter prior to delivery to the customer. And we mean “every” lifter, including those lifters that are manufactured by the hundreds in a single production run. In such instances, many companies would choose to randomly test just a few out of the batch. 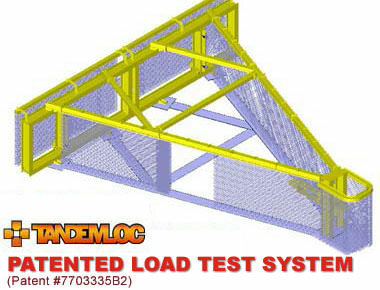 The Tandemloc Patented Load Test System test bed is 60' long and 13' wide and is very capable of testing a variety of custom items. At Tandemloc, every lifter is tested, period. The Tandemloc Load Test System can test a very wide variety of shapes and sizes, mainly due to the rolling beam feature and the shear size of the test bed, which provide countless anchoring locations so that the test load is properly experienced, as in actual field conditions. The system is also used to test Tandemloc tie-down products as well. The rolling beams have a number of pad eyes spaced equally along the Y-axis (vertical) and the beams can roll back and forth along the test bed, along the X-axis (horizontal). This provides instant anchoring points for test specimens of varying shapes and sizes, eliminating the need to measure, locate and weld permanent, fixed anchoring points. Although anchoring points can also be welded to the test bed perimeter, should the test specimen anchoring locations be beyond the field of points available by the X and Y axis of the rolling beams. For items that only require anchoring in one point, the center of the test bed can accommodate an anchoring point such as a clevis or pad eye that connects to the test bed. The Load Test System line of pull is in the horizontal direction, rather than vertical and that results in easier rigging, since the connections will always lie within the horizontal plane, at the same height. With machines that pull vertically, the connection point can vary in height making it more difficult to rig, often requiring the use of man-lifts or other equipment should these connection points be unreachable by a man standing on the floor. Loading test specimens into the test bed is simplified as 50% of the machine’s structure is below grade, allowing free movement of fork lifts right up to the test bed. The system incorporates a video system, which records every test and the load reading is actually fed directly onto the recorded image. The images can not be edited, which provide concrete proof that an item has been tested properly. This is a great quality assurance tool for Tandemloc and far better than just a paper certificate for the customer, who now can be absolutely convinced that his lifter was in fact tested. Proof Testing is important to our process — every lifter we manufacture is load tested. And, we can re-certify your older Tandemloc lifters with a new proof-test. See more about the recertification process.